Item #160582232599, USD$229.00, ends May 12. "It has been tested and it works fine. Ideal as a for those with a broken CPU board or just as a spare." Uh... simply I mean this could be bought by an amateur; CC+ a bit more cost and totally different matter. It was a citation from "Rust Never Sleeps" by (Canadian!) Neil Young. Uh... simply I mean this could be bought by an amateur; CC+ a bit more cost and totally different matter. It was a citation from "Rust Never Sleeps" by (Canadian!) Neil Young. Great album. I should dig it out ... but Neil hasn't lived here for decades. Following up to the April 9th note on the Chroma mailing list ("Advance Planning for Next CC+ Batch"), we have once again placed enough people on the CC+ wait list to justify another build of boards. We propose to accept orders for this next build up until end of day Sunday, May 15th. To ensure a timely order of parts for those who have requested CC+ boards, we would like to coordinate receipt of payment by Sunday, May 22nd. If you're not currently on the wait list - but would like to have a board from this build - please be sure to let me know before May 16th. If you believe you're on the wait list but have not recently received an e-mail from me to confirm, please let me know. Once again, thank you for your continued interest and participation with the CC+. Well, I think I'm going to be putting my Chroma up for sale soon. Before I list it on eBay I thought I'd check here and see if anyone, or anyone you know is looking for a Chroma. Works great, has always been serviced by Greg here in California. Really the only thing left to do on it is refinish the wood. I'll be taking some pictures later today if anyone is interested. I'm not a professional musician, it's time to let it go to someone who will hopefully put it to better use than just as a master controller (as great as it is for that!). I vacillated for along time over selling the Chroma, but as of today it will be heading to a new owner. Sad as I am, I'm happy it will be going to someone who will appreciate it as much as I have. I know I will more than likely never have another one, but circumstances both financially and professionally have dictated that I let go. I'n definitely better at collecting synths than letting go of them! inserted into 1st cardboard box - foam board strips hot glued to the box which will then slip into an outer box, making sure that the corners have plenty of protection. reinforced cutouts on the end of the boxes for places to carry, necessary? Pedals, interface and manuals boxed up and shipped separately . I'm concerned about the keys bouncing around, maybe a foam board cut to fit under the keys on the ends to keep them from moving up and down? And and all advice is appreciated, the last thing I want is to have anything happen to this beautiful synth! It will be fully insured if course. Going to miss this amazing support group for an amazing instrument! Hi there Chroma fans, Can someone help me out with the Cubase device panel for the Chroma? I've installed it, but when i open it inside Cubase i just get a blank screen without all those lovely sliders... Can't wait to get this working! I'm writing to let you know that I'm accepting orders for a production run of Enablers - my 96 knob physical controller for the CC+ equipped Rhodes Chroma. The price is $2,600 US, plus shipping, and orders will require an $800 US deposit. I anticipate a production time of approximately 6 months from the receipt of a deposit to the shipment of your Enabler. Because each Enabler is hand crafted, there are a few opportunities for customization - I'm currently making the outer case from Bubinga for a customer, and I can vary the dimensions and finish of the case to attempt to match those of your Chroma. Also, I can customize the startup screen to display (nearly) any text that you wish. Also, because each Enabler is hand crafted, there might be slight imperfections and variations in the casework, and in the operating system code; currently the LCD can become unresponsive after many hours of continuous use, but it's operation is restored after a power cycle. Shipping and insurance is expensive. I'll work with domestic and international customers to determine the best way to get your Enabler to you. If you're interested, please let me know, and send a deposit via PayPal. Just chiming in to add that Randel does fantastic hand build work on the Enabler and was great to work with. He even went out of his way to try and match my finish on my Chroma from pictures and was very successful. The Enabler brings out life from the Chroma that we didn't even know it had. Hope to see some other Enablers in the world soon. I hope to have a Enabled Chroma patch bank to share with the group by summer. I'm on the point to sell one of the 2 my beloved Rhodes Chroma the SN°21010228 under good conditions and fully repaired calibrated and upgraded with new power supply kit, Polyphonic Aftertouch board and CPU Plus (CC+) with the last eprom and display 4x20 from Luca Sasdelli  well know fine expert of the Chroma and designer of the power supply kit. Located in Italy. Rome. I will ship worlwide. I ask 3000 euro plus shipping. Any info at [email address removed]. certain patches in my chroma will exhibit a behavior, and i can't for the life of me tell if it's a function of the patch, or a machine error. on a few patches, if i depress and sustain 3 notes, they will all be in tune. as soon as i depress a 4th note or more, it will cause detuning in the chord to the point that its atonal. it sounds like an out of tune synth. if i release those notes, its back to normal. could this be one of the keyboard algorithms or something, or a fault? Sounds like a fault to me. The first thing I'd look at is the analog power supplies, to see if they're being yanked around by something. I'd look around the Channel Motherboard, and around the DAC circuit on the I/O Board. if i depress and sustain 3 notes, they will all be in tune. as soon as i depress a 4th note or more, it will cause detuning in the chord to the point that its atonal. What is the filter resonance set to for these patches? Some Chroma factory patches are based on tuned resonating filters, with the resonance all the way to 7 and the keyboard used as a modulator. So the tone you hear is created by the filter, not by the oscillator. Maybe some filters don't tune right, or the harmonics are really weird so you get beating between them as you add notes. Since the purchase of a Chroma fell through, i am keen to buy one and thought that the mailing list would be a good place to start looking for one. I'd prefer to buy one in unrestored (even broken) condition as long as it is complete. If anyone has one, please let me know. I happen to have a broken Chroma that I am willing to sell. Originally I was going to use the voice cards to swap with my working Chroma, but more recently I have been thinking on just selling it. I would probably be asking 1800.00 usd for this Chroma plus shipping (I would prefer a pickup though, but am willing to ship.) Let me know if you have any questions and I will try to answer them. I am considering selling my old friend. It has been a wonderful keyboard that has been on a lot of jobs with me. I bought it new in Las Veags in 1982. It is in almost perfect working condition. There is one note where the contact is broken and the MIDI interface, from ChromaCult, sometimes doesn't act right sometimes. I just reboot it and it works fine for a while. I haven't had it on for more than an hour at a time for the past few years but I can dump sysex files back and forth from my computer and it records fine. I have all three pedals and an extra sustain pedal that I have used for spare parts. I still have the anvil case that it came in and would ship it in that. Where ever it goes the shipping will be high. I also have all the original manuals and cassettes of the factory sounds. I can send photos [see registry entry for photos] if anyones is interested. Make me an offer. Item #180667009760, current bid UAD$30.00, ends May 24. Programming Manual, Performance Manual, and "engineering updates for interfacing with an Apple II." 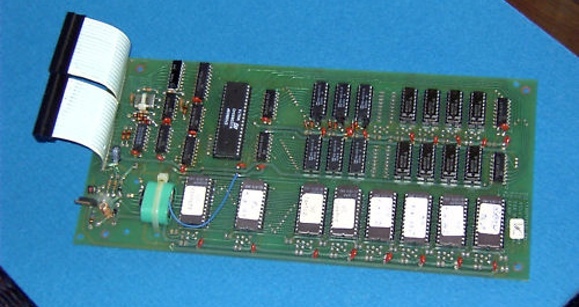 This could be Appendix O from the Sequencer Manual, Hardware Description and Specifications; I've asked the seller. Sold for AUD$30.00. 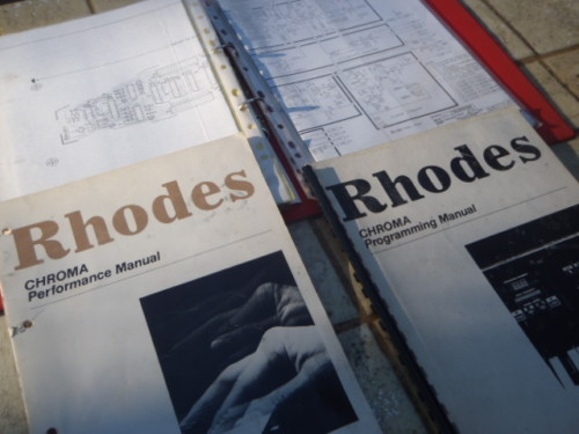 I did hear back from the seller, and I was right about Appendix O: "Yeah it's mostly from the sequencer manual REV 5 January 24 1984.There's also 2 schematics COMP/CHROMA INTERFACE (Drawing # 30-45587 6/21/82) & PC CHROMA/COMPUTER INTERFACE (Drawing # 30-77241 10/6/82) Also included is a 4 page review from April '83 E&MM "Playing the Rhodes Chroma with the Apple II Sequencer." Item #160589806496, ended by the seller. Was AUD$5,500.00 or "buy it now" of AUD$7,000.00. Not much info on this on in the registry (see 21040003); was owned at least last year by Greg Hutchings of Hutchings Keyboards. "100% functional, refinished wood parts, new power supply and CC+ computer board with midi interface. Recently serviced by Hutchings keyboards the Chroma Specialists and the original distribution and service centre for them in Australia. Included is original performance manual and midi interface. Only thing is one discolored key but I hear this is fixable." hi all, so i have noticed that the zero point of lever 1 is not at its resting point. lever 2 is calibrated perfectly. i'm assuming there's a way to calibrate the levers, but when i look in the assembly, i don't see a trim pot, and skimming thru the calibration procedure, i see nothing related to it. is it possible? also, just to pass the piece of info along, i found the source of my weird pitch modulation issue, where any more than 3 depressed keys at once would cause certain patches to go completely out of tune. if the pitch modulation on these patches is set to #15, pressure threshold i believe, it causes this. not sure why, as my machine doesn't have the pressure board installed.....strange. anyway, thanks for any tips on the levers. The ADC without a pressure sensor installed will resolve some value. I recall this has been mentioned on Chromatalk. The levers are designed so that there is sufficient overtravel that they always go from min to max--that's why there's a significant dead zone at each end. On power-up, their positions are read, and used as the zero reference from then on. If you hold a lever off-center while you power-up, you'll have this problem. If you're having this problem without holding the lever off-center, it probably means that the lever handle has slipped on the pot shaft to a point beyond what the software is willing to believe is the center. Loosen the set screw on the handle, turn the pot shaft until the pot is putting out about 2.5V, and retighten. The pressure input to the A/D converter is a floating high-impedance input if you don't have the pressure sensor installed. The A/D converter only reads the keys that are assigned to channels, so the more channels are playing sounds that use pressure, the more times in a processing cycle the A/D input will be connected to the floating pressure line. I can easily imagine capacitive coupling developing a small DC level on this line when this happens. Solution: poke a piece of wire into J22 between pins 6 and 9. Or, just Don't Do That. The levers are designed so that there is sufficient overtravel that they always go from min to max--that's why there's a significant dead zone at each end. On power-up, their positions are read, and used as the zero reference from then on. If you hold a lever off-center while you power-up, you'll have this problem. On one of my Chromas, depending on whether I let it go from above or below, the "pitch" lever doesn't return to the exact same position. With bend ranges of two semitones it's not much of a problem, but when it's an octave or so, the keyboard is seriously sharp or flat. I adapted to it by always doing a quick pull after any push. There's some dead zone in the software, so that suggests that there's some excess mechanical friction. As I recall, the leaf springs pop out pretty easily, so you might wipe them off, and then grease them with a little Vaseline or something. For a while, it would work OK, but if left on for some time, all of the boards would fail to tune. then, it would fail to tune AND the MIDI out didn't work. All of the panel lights work OK, abnd it saves/retrieves programs OK too. One of the voice boards, when you plug it in, causes the instrument to fail in the way mentioned above - tune shows all boards at fault, no sound, no midi. Slot 0 on the motherboard does not work - any voice board plugged into this will fail its tuning routine. I ran the instrument as a six-voice for a while, it was nice to hear it again! - then it failed again. The instrument now will not produce either sound or MIDI output, when the tuning button or set split 50 is/are pressed, it shows several voices as failing the tuning routine - each time I press do this, it typically shows different boards at fault, only the 2 empty slods come us consistently, as one might expect. The instument has the CC+ fitted, and also a slight variant of Don Tillman's power supply upgrade, which was fitted by Tony Allgood a few years ago, since which time the instrument has worked great until now. The 2 dud boards I'm going to change the 3 logic chips on, as per the fault diagnosis page on the chroma website, then try to trace the fault if that doesn't fix it. I also intend to open the instrument up again at the weekend and carry out some of the tests listed on the fault diagnosis page, and see if the voltages etc all measure up OK. In the meantime, does any of this sound familiar to board users who have repaired their instruments? I suggest trying to gradually isolate the faults. First of all the motherboard: please check if any bent pin on voice board connectors is visible and, if found any, reseat them. To re-solder motherboard connectors could be a nice idea too. CPS production run #5 winding down. All PCB's are built, awaiting final assembly, test and ship. I have a couple extra so if no further takers, I am going to put the remainder on Ebay to hit that bigger audience. I think RhodesChroma only has 150 or so members. Suprising given the estimated 1500+ Chromas in existence! I just want to unload what's left. I do plan to update the webpage to reflect the Rev 2 hardware and installation. I will include the Cadstar Eagle Schematic and PCB files for completeness and repeatability. Anyway, Hope you folks that have installed CPS kits are happy with the added performance! surely your kit is a huge improvement to the Chroma; I've installed three of them as an easy job. I've got only one issue: it has been happened only once, but the adhesive pad did detach from the PCB on bass keyboard side, so the PCB was hanging and touching the keys. I suggest to extend the PCB about 1cm extra per side, to allow a hole for securing the edge with a screw to the wood. The centre part is always held by the encoder PCB, so there is no need for further mods. There was one sensor array delamination issue that I heard about at the PCB/wood backing support layer. I use 3M 77 Spray adhesive there and simply did not apply enough in that instance. The issue was resolved in the field by re-gluing with a generic non-conductive adhesive available from your local hardware store. In your case was it a similar failure or just the bottom Felt Pad layer? If just the Felt pad, then a thin layer of flexible or silicone based adhesive would repair that. There are 6 .063" holes spaced about the sensor array PCBs between the sensor circuits that could be used for a mechanical attachment. They do not extend through the other layers. See attached drawing. The kit is great Chris, I think we all agree on that. On other pages and lists people add sync, an extra LFO or similar minor mods on their synths. Here pro-kits with brand new CPU-design, drop-in replacement of PSU and new designed aftertouch are offered. What's not to like? surely good glue could solve this issue, but I feel more safe by using those holes kindly highlighted by Chris Borman, to firmly hold the PCB with a few small screws. Glue was quicker. I'll turn (pun intended) to screws next time if it'll come loose again. Item #300561152460, starting bid USD$40.00 or "buy it now" for $150.00, no bids yet, ends May 30. No description, but there is a picture. I'm guessing based on the schematic that this is a Channel Mother Board? Correct - that's what it is. 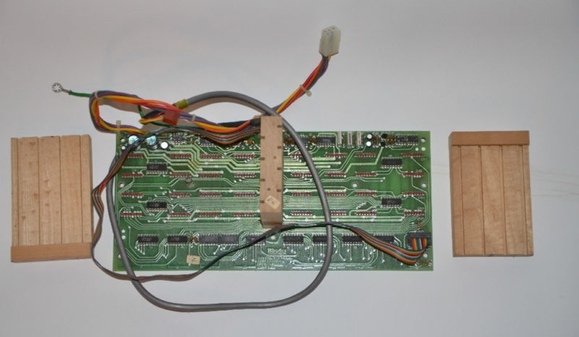 The wooden blocks to hold the voice boards upright on the motherboard are shown in the picture too. JL Cooper interface [item #120727793106] (78 euros) and original Chroma product leaflet [item #230625294538] (10 euros) on german ebay now. The maniac selling the TBS interface is not giving up either: [item #350016598934] (399 euros). JL Cooper interface and original Chroma product leaflet on german ebay now. This was for sale last month; see midi interface on ebay.de. Interestingly, it seems to have a differently shaped enclosure from those shown at the site: see JLCooper ChromaFace. The maniac selling the TBS interface is not givning up either (399 euros).